It’s been a long time since I’ve written a book review, eh? I’ve barely had time to read this year but Blood and Earth demanded I read it with some kind of immediacy and then tell everyone that they need to read it too. I can’t speak for everyone but I went into this book thinking I knew about where things were coming from but I was wrong. I was shocked by a lot of the things I read. I had no clue that shrimps were harvested by young boys and men who had been lied to, enslaved, abused, and forced to live in awful conditions with the threat of death if they tried to escape back to their families. I honestly would never have made the logical leap from shrimp farming to slavery. Never. It is very easy for us to buy into marketing and what we are told by retailers without ever questioning the origin of our phones, laptops, food, or clothes. It’s easy to be ignorant because you don’t have to ask that many questions before you feel very uncomfortable. By buying a product we are, whether we like it or not, agreeing with the practices of a company we buy from. Large, global retailers don’t really care about anything aside from profit and to force them to change their profit needs to suffer. This leaves us with the reponsibility of holding companies accountable with you and me. By actually asking companies to change and voting with our money we can make companies aware of the way we feel about their actions. More transparency is needed and until we demand it most retailers probably won’t feel obliged to provide it. The kind of scum who value profit above people’s lives are also the kind of people who don’t care about the environment. Mining for gold has resulted in streams and rivers being polluted with mercury, which local families use drink, wash in, or use for cooking. Would we stand for that happening in our own towns? No. The demand for charcoal has resulted in large chunks of forests being decimated and ecosystems destroyed, resulting in not just loss of species but severe flooding in local areas because the forests “held” the water. Mangrove forests are being destroyed for shrimp farming. The problem with this is, again, not just related to the ecosystems and species being wiped out, but mangrove forests are also huge carbon sinks. When they’re destroyed, that CO2 is released into the atmosphere. None of these are positives and Kevin Bales does an incredible job of explaining the link between slavery and the destruction of the environment. He states that if you combined the CO2 pollution of global slavery, it would be the third biggest polluter behind America and China. If not for humane reasons, slavery needs to be stopped. This might sound cliche but you will struggle not to question your buying choices or retailers actions after reading this. And that is perfect and exactly what the world needs. In one of the last chapters, Kevin shares the story of Claudio and Maria; two environmentalists who lived on their farm in Brazil and taught others how to live and make money off their farms without being destructive. Disgustingly, they (along with hundreds of others) were killed because they stood in the way of people who wanted to destroy the forests for profit. The loss of their lives can’t be in vain and who wants us to be sitting around in years to come and think we should have taken action sooner? Ok, so let me preface this by saying not all governments are idiots. The UK and US governments seem especially moronic and ignorant when it comes to the environment at the moment. In America, you have a President who thinks climate change has been invented. In the UK, we are in the run up to a general election and the current party in power aren’t talking about the environment at all in their manifesto. In the UK, the capital city breached annual legal pollution limits for 2017 after just five days. And, the UK government has failed on repeated occasions to clean up the air in London, despite thousands deaths as a result of it. This is not acceptable. The more of us who are educated, the more we can force change. I’m not going to lie, this isn’t a happy Sunday afternoon read but it is an important read that shouldn’t be ignored, no matter how bad it makes us feel. I did actually find Blood and Earth to be a really gripping read because I just needed to know more immediately. Despite all the horror, it’s an inspiring read to know that we are responsible and can force change. I’d also like to point out that I’m not suggesting that if we all read this book things will change instantly and it’ll be a walk in the park, full of sunshine, bunny rabbits and fluffy clouds. This book isn’t a silver bullet, it’s a starting point. It will be hard to change our society and the things we take for granted, and have become so reliant on. No one said change was supposed to be easy but if we want to ensure slavery is wiped out, want to enjoy the natural beauty of this planet, and continue sharing it with wonderful species that are vital to the ecosystem, we have to try. 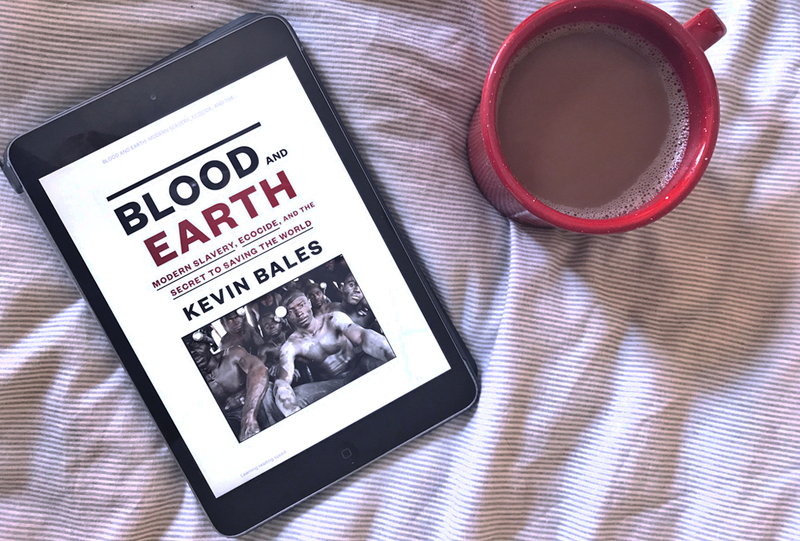 If you’re intrigued by Blood and Earth, or want to know more, you might also like to read Kevin Bales’ interview with NPR (it’s written so you don’t need audio). If you’ve got any suggestions for environmental / ethical reads, please send them my way.